Dead limbs can be a risk to your house and your neighbors. If a sudden storm comes through your city, hanging limbs can be blown and thrown. Tree limbs can end up on your neighbors’ roof or your roof. Limbs and large tree stumps can end up across the streets, hitting cars. Summer yard maintenance includes cutting, sprucing, trimming and mowing so as to have a healthy lawn. First, is trimming and cutting all dead limbs from trees. Those who have big or small trees in front or back lawns should cut them to prevent any potential danger. If there is a thunderstorm, or other weather related event, it can cause big or small dead limbs to break and be blown away. With wind and rain in the summer, thunderstorms end up being merciless. Although, trimming and pruning vines and bushes can help. Rain helps them grow faster; especially, around the house. Before you know it, they will begin growing around window seals. Also, plants and bushes can interfere with window openings and air condition units. When this happens, this leads the way for critters to work and find a way to get in through discreet openings. Left uncut, the vines will get moisture trapped, thus, inviting unwanted insects and bugs crawling all over the vines. Plus, this invites burglars inside as well, as they can hide better behind bushy areas; especially near windows. So, by clearing the area from vines and bushes around the entire house, it will reduce hiding areas for burglars. Once your house is cleared from obstruction, your lawn/yard will look much greener on your side of the fence. And speaking of greener on this side of the fence; keeping your lawn semi-high will have a positive effect on the grass. It will keep your grass productive and healthy. All lawns do not always have to be short. When cutting, it is recommended that you have the blades high. Which according to some experts, it is a benefit for the overall health of the grass. More light rays are able to get to the taller blades of grass. Especially during the peak hours of the day which will then help with nutrient formations within your lawn. When the sunlight hits the grass blades, it uses the energy produced by it for the overall growth, including for the surround soil its in (Source: http://www.lawncare.org/organic-lawn-care/). During the days when the growing season hits its highest peak (the apex), plants, trees, and your lawn can be at risk. When there is hot and dry weather, the water or drought alerts are at a high in some cities and towns. Make sure that correct watering and the right amount of conservation is important throughout the year. Morning hours will reduce the water loss from evaporation. 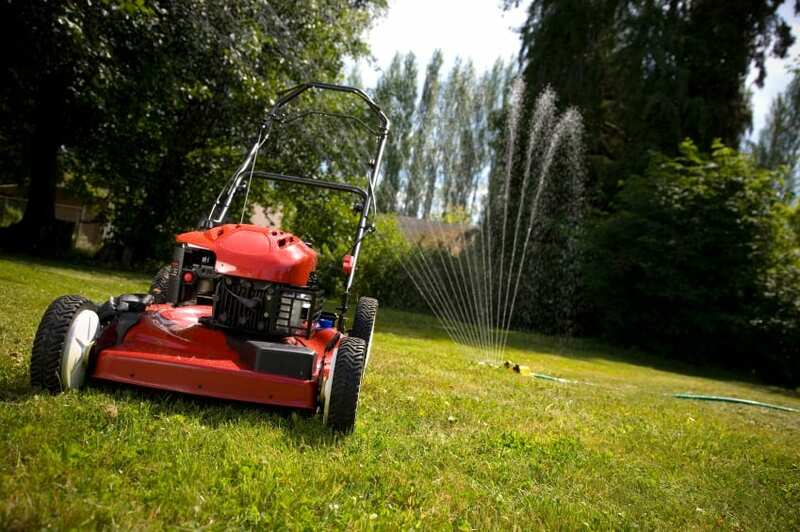 By using some of the latest in lawn care; supplies like sprinklers can be beneficial for any homeowner. Some of the sprinklers that can be used are portable sprinklers, stationary sprinklers, rotary and impact sprinklers, oscillating sprinklers or an irrigation system, the most popular. The irrigation system is known to be used for conserving water with its timer based options (Source: Tai, Kerry. The Lawn Doctor: “Best ways to water your lawn.” July 25, 2015). Your yard will have clues as to how it is; is it healthy or not? Colors and textures will be noticeable and irregular signs will stand out. In brief, getting to know how to read into your lawn can actually save your lawn. With indications such as holes on leaves, irregular colors and texture in your grass and tree leaves, it can be a warning sign for pests and bugs eating up into your yard. Additionally, if you do not treat your lawn immediately when you notice the above signs (discolor, texture, holes…etc. ), disease or pests will continue to cause further damage to your greenery. Inspect your yard by checking for uniformed color, lush green colored grass, and leaves. If not, you may have a pest problem or an over-dried, dehydrated lawn. Improving the quality of your lawn or yard is time sensitive. As a result of caring for your lawn with these 4 tips for summer yard maintenance, you can have a beautiful trimmed yard you’ll be proud of. So, moderating your mowing and watering with adequate care while treating it for pests or bugs will restore your lawn from further harm or prevent it from getting like damaged in the future.